For other uses, see VP9 (disambiguation). VP9 is the successor to VP8 and competes mainly with MPEG's High Efficiency Video Coding (HEVC/H.265). At first, VP9 was mainly used on Google's video platform YouTube. The emergence of the Alliance for Open Media, and its support for the ongoing development of the successor AV1, of which Google is a part of, led to growing interest in the format. In contrast to HEVC, VP9 support is common among web browsers (see HTML5 video § Browser support). The combination of VP9 video and Opus audio in the WebM container, as served by YouTube, is supported by roughly ​4⁄5 of the browser market (mobile included) as of June 2018. The two holdouts among major browsers are the discontinued Internet Explorer (unlike its successor Edge) and Safari (both desktop and mobile versions). Android has supported VP9 since version 4.4 KitKat. Parts of the format are covered by patents held by Google. The company grants free usage of its own related patents based on reciprocity, i.e. as long as the user does not engage in patent litigations. VP9 is customized for video resolutions greater than 1080p (such as UHD) and also enables lossless compression. The VP9 format supports the following color spaces: Rec. 601, Rec. 709, Rec. 2020, SMPTE-170, SMPTE-240, and sRGB. VP9 supports HDR video using Hybrid Log-Gamma (HLG) and Perceptual Quantizer (PQ). An early comparison that took varying encoding speed into account showed x265 to narrowly beat libvpx at the very highest quality (slowest encoding) whereas libvpx was superior at any other encoding speed, by SSIM. In a subjective quality comparison conducted in 2014 featuring the reference encoders for HEVC (HM 15.0), MPEG-4 AVC/H.264 (JM 18.6), and VP9 (libvpx 1.2.0 with preliminary VP9 support), VP9, like H.264, required about two times the bitrate to reach video quality comparable to HEVC, while with synthetic imagery VP9 was close to HEVC. By contrast, another subjective comparison from 2014 concluded that at higher quality settings HEVC and VP9 were tied at a 40 to 45% bitrate advantage over H.264. Netflix, after a large test in August 2016, concluded that libvpx was 20% less efficient than x265, but by October the same year also found that tweaking encoding parameters could "reduce or even reverse gap between VP9 and HEVC". At NAB 2017, Netflix shared that they had switched to the EVE encoder, which according to their studies offered better two-pass rate control and was 8% more efficient than libvpx. An offline encoder comparison between libvpx, two HEVC encoders and x264 in May 2017 by Jan Ozer of Streaming Media Magazine, with encoding parameters supplied or reviewed by each encoder vendor (Google, MulticoreWare and MainConcept respectively), and using Netflix's VMAF objective metric, concluded that "VP9 and both HEVC codecs produce very similar performance" and "Particularly at lower bitrates, both HEVC codecs and VP9 deliver substantially better performance than H.264". An encoding speed versus efficiency comparison of the reference implementation in libvpx, x264 and x265 was made by an FFmpeg developer in September 2015: By SSIM index, libvpx was mostly superior to x264 across the range of comparable encoding speeds, but the main benefit was at the slower end of x264@veryslow (reaching a sweet spot of 30–40% bitrate improvement within twice as slow as this), whereas x265 only became competitive with libvpx around 10 times as slow as x264@veryslow. It was concluded that libvpx and x265 were both capable of the claimed 50% bitrate improvement over H.264, but only at 10–20 times the encoding time of x264. Judged by the objective quality metric VQM in early 2015, the VP9 reference encoder delivered video quality on par with the best HEVC implementations. A decoder comparison by the same developer showed 10% faster decoding for ffvp9 than ffh264 for same-quality video, or "identical" at same bitrate. It also showed that the implementation can make a difference, concluding that "ffvp9 beats libvpx consistently by 25–50%". Another decoder comparison indicated 10–40 percent higher CPU load than H.264 (but does not say whether this was with ffvp9 or libvpx), and that on mobile, the Ittiam demo player was about 40 percent faster than the Chrome browser at playing VP9. Transform coefficients are scanned in a round pattern (increasing distance from the corner). This is to coincide (better than the traditional zig-zag pattern) with the expected order of importance of the coefficients, so to increase their compressibility by entropy coding. A skewed variant of the pattern is used when the horizontal or vertical edge is more important. VP9 is a traditional block-based transform coding format. The bitstream format is relatively simple compared to formats that offer similar bitrate efficiency like HEVC. VP9 has many design improvements compared to VP8. Its biggest improvement is support for the use of coding units of 64×64 pixels. This is especially useful with high-resolution video. Also the prediction of motion vectors was improved. In addition to VP8's four modes (average/"DC", "true motion", horizontal, vertical), VP9 supports six oblique directions for linear extrapolation of pixels in intra-frame prediction. In order to enable some parallel processing of frames, video frames can be split along coding unit boundaries into up to four rows of 256 to 4096 pixels wide evenly spaced tiles with each tile column coded independently. This is mandatory for video resolutions in excess of 4096 pixels. A tile header contains the tile size in bytes so decoders can skip ahead and decode each tile row in a separate thread. The image is then divided into coding units called superblocks of 64×64 pixels which are adaptively subpartitioned in a quadtree coding structure. They can be subdivided either horizontally or vertically or both; square (sub)units can be subdivided recursively down to 4×4 pixel blocks. Subunits are coded in raster scan order: left to right, top to bottom. Starting from each key frame, decoders keep 8 frames buffered to be used as reference frames or to be shown later. Transmitted frames signal which buffer to overwrite and can optionally be decoded into one of the buffers without being shown. The encoder can send a minimal frame that just triggers one of the buffers to be displayed ("skip frame"). Each inter frame can reference up to three of the buffered frames for temporal prediction. Up to two of those reference frames can be used in each coding block to calculate a sample data prediction, using spatially displaced (motion compensation) content from a reference frame or an average of content from two reference frames ("compound prediction mode"). The (ideally small) remaining difference (delta encoding) from the computed prediction to the actual image content is transformed using a DCT or ADST (for edge blocks) and quantized. Something like a b-frame can be coded while preserving the original frame order in the bitstream using a structure named superframes. Hidden alternate reference frames can be packed together with an ordinary inter frame and a skip frame that triggers display of previous hidden altref content from its reference frame buffer right after the accompanying p-frame. VP9 enables lossless encoding by transmitting at the lowest quantization level (q index 0) an additional 4×4-block encoded Walsh–Hadamard transformed (WHT) residue signal. In order to be seekable, raw VP9 bitstreams have to be encapsulated in a container format, for example Matroska (.mkv), its derived WebM format (.webm) or the older minimalistic Indeo video file (IVF) format which is traditionally supported by libvpx. VP9 is identified as V_VP9 in WebM and VP90 in MP4, adhering to respective naming conventions. Adobe Flash, which traditionally used VPx formats up to VP7, was never upgraded to VP8 or VP9, but instead to H.264. Therefore, VP9 often penetrated corresponding web applications only with the gradual shift from Flash to HTML5 technology, which was still somewhat immature when VP9 was introduced. Trends towards UHD resolutions, higher color depth and wider gamuts are driving a shift towards new, specialized video formats. With the clear development perspective and support from the industry demonstrated by the founding of the Alliance for Open Media, as well as the pricey and complex licensing situation of HEVC it is expected that users of the hitherto leading MPEG formats will often switch to the royalty-free alternative formats of the VPx/AVx series instead of upgrading to HEVC. A main user of VP9 is Google's popular video platform YouTube, which offers VP9 video at all resolutions along with Opus audio in the WebM file format, through DASH streaming. Another early adopter is Wikipedia (specifically Wikimedia Commons, which hosts multimedia files across Wikipedia's subpages and languages). Wikipedia endorses open and royalty-free multimedia formats. As of 2016, the 3 accepted video formats are VP9, VP8 and Theora. As of December 2016, Netflix is working to add VP9 encoding to their catalog, alongside AVC High, for bitrates aimed at mobile users. Google Play Movies & TV uses (at least in part) VP9 profile 2 with Widevine DRM. A series of cloud encoding services offer VP9 encoding, including Amazon, Bitmovin, Brightcove, castLabs, JW Player, Telestream, and Wowza. Encoding.com has offered VP9 encoding since Q4 2016, which amounted to a yearly average of 11% popularity for VP9 among its customers that year. JW Player supports VP9 in its widely used software-as-a-service HTML5 video player. Microsoft Edge (as of summer 2016). Internet Explorer and Apple Safari are missing VP9 support completely. In March 2016 an estimated 65 to 75% of browsers in use on desktop and notebook systems were able to play VP9 videos in HTML5 webpages, based on data from StatCounter. - On Anniversary Update (1607), limited support is available in Microsoft Edge (via MSE only) and Universal Windows Platform apps. - On April 2018 Update (1803) with Web Media Extensions preinstalled, Microsoft Edge (EdgeHTML 17) supports VP9 videos embedded in <video> tags. - On October 2018 Update (1809), VP9 Video Extensions is preinstalled. It enables encoding of VP8 and VP9 content on devices that don’t have a hardware-based video encoder. No native support in the macOS native multimedia framework. - Support introduced in Android 4.4 No native support in the iOS native multimedia framework. VP9 is supported in all major open source media player software, including VLC, MPlayer/MPlayer2/MPV, Kodi, MythTV and FFplay. Android has had VP9 software decoding since version 4.4 "KitKat". For a list of consumer electronics with hardware support, including TVs, smartphones, set top boxes and game consoles, see webmproject.org's list. The following chips, architectures, CPUs, GPUs and SoCs provide hardware acceleration of VP9. Some of these are known to have fixed function hardware, but this list also incorporates GPU or DSP based implementations – software implementations on non-CPU hardware. The latter category also serve the purpose of offloading the CPU, but power efficiency is not as good as the fixed function hardware (more comparable to well optimized SIMD aware software). Intel Kaby Lake, Coffee Lake, Whiskey Lake, Amber Lake, Apollo Lake and Gemini Lake CPU families, AMD Raven Ridge APU family, and Nvidia Maxwell GM206, Pascal, Volta & Turing GPU families have full fixed function VP9 hardware decoding for highest decoding performance and power efficiency. All the hardware below offers hardware accelerated decoding. Cite error: A list-defined reference with group name "lower-alpha" is not used in the content (see the help page). This is not a complete list. Further SoCs, as well as hardware IP vendors can be found at webmproject.org. The reference implementation from Google is found in the free software programming library libvpx. It has a single-pass and a two-pass encoding mode, but the single-pass mode is considered broken and does not offer effective control over the target bitrate. FFmpeg's VP9 decoder takes advantage of a corpus of SIMD optimizations shared with other codecs to make it fast. A comparison made by an FFmpeg developer indicated that this was faster than libvpx, and compared to FFmpeg's h.264 decoder, "identical" performance for same-bitrate video, or about 10% faster for same-quality video. VP9 is the last official iteration of the TrueMotion series of video formats that Google bought in 2010 for $134 million together with the company On2 Technologies that created it. The development of VP9 started in the second half of 2011 under the development names of Next Gen Open Video (NGOV) and VP-Next. The design goals for VP9 included reducing the bit rate by 50% compared to VP8 while maintaining the same video quality, and aiming for better compression efficiency than the MPEG High Efficiency Video Coding (HEVC) standard. In June 2013 the "profile 0" of VP9 was finalized, and two months later Google's Chrome browser was released with support for VP9 video playback. In October of that year a native VP9 decoder was added to FFmpeg, and to Libav six weeks later. Mozilla added VP9 support to Firefox in March 2014. In 2014 Google added two high bit depth profiles: profile 2 and profile 3. In 2013 an updated version of the WebM format was published, featuring support for VP9 together with Opus audio. In March 2013, the MPEG Licensing Administration dropped an announced assertion of disputed patent claims against VP8 and its successors after the United States Department of Justice started to investigate whether it was acting to unfairly stifle competition. Throughout, Google has worked with hardware vendors to get VP9 support into silicon. In January 2014, Ittiam, in collaboration with ARM and Google, demonstrated its VP9 decoder for ARM Cortex devices. Using GPGPU techniques, the decoder was capable of 1080p at 30fps on an Arndale Board. In early 2015 Nvidia announced VP9 support in its Tegra X1 SoC, and VeriSilicon announced VP9 Profile 2 support in its Hantro G2v2 decoder IP. In April 2015 Google released a significant update to its libvpx library, with version 1.4.0 adding support for 10-bit and 12-bit bit depth, 4:2:2 and 4:4:4 chroma subsampling, and VP9 multithreaded decoding/encoding. In December 2015, Netflix published a draft proposal for including VP9 video in an MP4 container with MPEG Common Encryption. In January 2016, Ittiam demonstrated an OpenCL based VP9 encoder. The encoder is targeting ARM Mali mobile GPUs and was demonstrated on a Samsung Galaxy S6. VP9 support was added to Microsoft's web browser Edge. It is present in development releases starting with EdgeHTML 14.14291 and due to be officially released in summer 2016. In March 2017, Ittiam announced the completion of a project to enhance the encoding speed of libvpx. The speed improvement was said to be 50-70%, and the code "publicly available as part of libvpx". In March 2019, Luxembourg-based Sisvel announced the formation of patent pools for VP9 and AV1. Members of the pools included JVC Kenwood, NTT, Orange S.A., Philips, and Toshiba, all of whom were also licensing patents to the MPEG-LA for either the AVC, DASH, or the HEVC patent pools. Sisvel announced it would demand a licensing fee for devices using VP9, but would not seek royalties for encoded content. At the time of the announcement, a list of patents owned by Sisvel was not publicly available. However, Sisvel's CEO stated in an interview that such a list would be posted on Sisvel's website before any licensing demands were sent out. "VP10" redirects here. For other uses, see VP10 (disambiguation). On September 12, 2014, Google announced that development on VP10 had begun and that after the release of VP10 they plan to have an 18-month gap between releases of video formats. In August 2015, Google began to publish code for VP10. However, Google decided to incorporate VP10 into AOMedia Video 1 (AV1). The AV1 codec will use elements of VP10, Daala (Xiph/Mozilla) and Thor (Cisco). Accordingly, Google has stated that they will not deploy VP10 internally nor officially release it, making VP9 the last of the VPx-based codecs to be released by Google. ^ "caniuse.com: WebM". 16 November 2016. Retrieved 16 November 2016. ^ "YouTube Stops H.264 4K Encoding; Will Apple Get on Board?". 25 January 2017. Retrieved 28 January 2017. ^ "Add slightly more colorspace variations". Chromium (web browser). Google. 2013-06-07. Retrieved 2013-06-19. ^ "Change the use of a reserved color space entry". Chromium (web browser). Google. 2014-11-06. Retrieved 2014-11-07. ^ "HDR Video Playback". Android. Retrieved 2016-09-23. ^ Ramus Larsen (2016-09-07). "Android TV 7.0 supports Dolby Vision, HDR10 and HLG". flatpanelshd. Retrieved 2016-09-23. ^ a b Ronald S. Bultje (September 28, 2015). "VP9 encoding/decoding performance vs. HEVC/H.264". Retrieved June 5, 2016. x265/libvpx are ~50% better than x264, as claimed. But, they are also 10–20x slower. ^ "The State of Codecs 2017". streamingmedia.com. 2017-03-22. Retrieved 2017-05-22. ^ "NAB 17 Codec Roundup". 5 May 2017. Retrieved 22 May 2017. ^ Ozer, Jan. "HEVC: Rating the contenders" (PDF). Streaming Learning Center. Retrieved 22 May 2017. ^ a b c d e Jan Ozer, Juni 2016: VP9 Finally Comes of Age, But Is it Right for Everyone? ^ "VP9 Bitstream & Decoding Process Specification" (PDF). 2016-03-31. Retrieved 2016-11-09. ^ a b Pieter Kapsenberg (2013-10-08). "How VP9 works, technical details & diagrams". Doom9's Forum. Retrieved 2014-03-31. ^ a b c "VP-Next Overview and Progress Update" (PDF). WebM Project. Google. Retrieved 2012-12-29. ^ a b c d Adrian Grange. "Overview of VP-Next" (PDF). Internet Engineering Task Force. Retrieved 2012-12-29. ^ Max Sharabayko (2013-10-22). "Next Generation Video Codecs: HEVC, VP9, Daala" (in German). Retrieved 2015-08-09. ^ Christopher Montgomery (2013-08-12). "Introducing Daala part 3: Time/Frequency Resolution Switching". Monty's demo pages. Xiph.Org, Red Hat Inc. Retrieved 2016-07-19. We submitted this WHT plus a few variants to Google for use in VP9's lossless coding mode; they chose one of the alternate versions of the WHT illustrated above. ^ "WebM Container Guidelines". 2017-11-28. Retrieved 19 December 2018. ^ "Help:Converting video". Retrieved 2016-09-19. 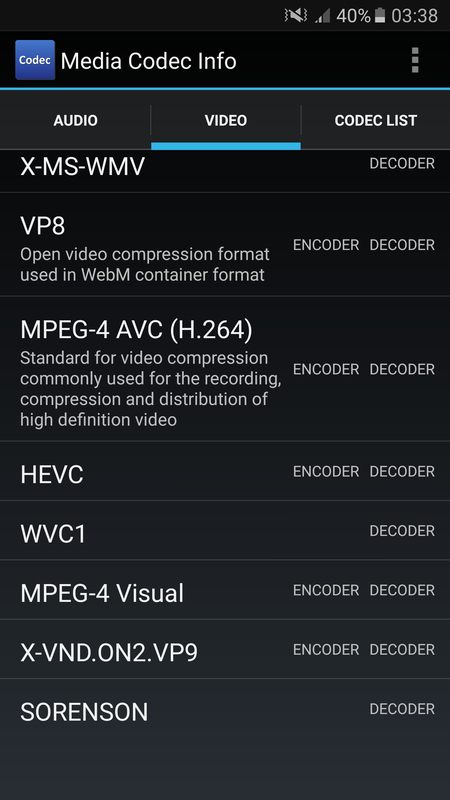 ^ "More Efficient Mobile Encodes for Netflix Downloads". The Netflix Tech Blog. 1 December 2016. Retrieved 6 December 2016. In this blog post, we summarize our recent work on generating more efficient video encodes, especially targeted towards low-bandwidth connections. We refer to these new bitstreams as our mobile encodes. (…) The VP9-Mobile streams show more gains and can deliver an average of 36% bitrate savings according to PSNR and VMAF. (…) Last month, we started re-encoding our catalog to generate the new mobile bitstreams and the effort is ongoing. ^ "[Updated – It will soon]NVIDIA SHIELD Android TV Does Not Support Google's 4K Content". 2016-12-09. Retrieved 17 April 2017. NVIDIA has now confirmed to us that the SHIELD Android TV will be updated in due course to support encrypted VP9 and Google Play Movies & TV 4K content. ^ "MPEG-DASH VP9 for VoD and Live - Bitmovin". Bitmovin. 2017-03-24. Retrieved 2017-10-29. ^ "Encoding.com releases support for VP9". 2016-08-31. Retrieved 17 May 2017. ^ "HLS still "industry standard" says encoding.com report". 2017-03-09. Retrieved 17 May 2017. ^ "[chrome] Revision 172738". Src.chromium.org. Retrieved 2016-09-27. ^ Volker Zota (2013-06-18). 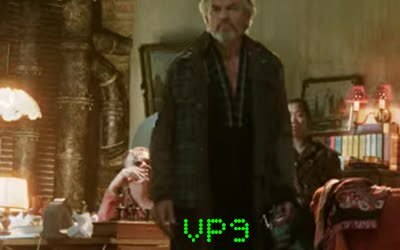 "Googles Web-Videocodec VP9 auf der Zielgeraden" (in German). Heise Newsticker. Retrieved 2014-11-01. ^ a b Peter Bright (2016-04-18). "Windows 10 Anniversary Update: Google's WebM and VP9 codecs coming to Edge". Ars Technica. ^ "Release Notes – 0.28". 11 April 2016. Retrieved 23 April 2016. ^ "android supported media formats". Retrieved 9 September 2015. ^ a b "SoCs Supporting VP8/VP9 – wiki". wiki.webmproject.org. Retrieved 2016-01-18. ^ a b c d e "Imagination makes efficient VP9 video decode a reality for all mainstream devices". Imagination Blog. Retrieved 2016-09-28. ^ "Radeon™ Pro WX series, the first Polaris architecture-based workstation products". amd.com. 2016-07-25. Retrieved 2016-07-26. ^ "AMD Launches the Radeon Rebellion with the Radeon™ RX 480 Graphics Card, Available Now". amd.com. 2016-06-29. Retrieved 2016-07-26. ^ a b "Processors for Laptops - 7th Generation AMD A-Series APUs". amd.com. Retrieved 2016-11-30. ^ a b "Radeon's next-generation Vega architecture" (PDF). AMD. 2017-08-13. Retrieved 2017-08-27. Vega can also decode the VP9 format at resolutions up to 3840x2160 using a hybrid approach where the video and shader engines collaborate to offload work from the CPU. ^ Michael, Larabel. "Radeon VCN Encode Support For RadeonSI Gallium3D". Phoronix.com. Retrieved 21 December 2017. ^ "Compatible chipsets". kodi.wiki. Retrieved 2016-08-05. ^ "ARM Announces Mali-G51 Mainstream GPU, Mali-V-61 Video Processing Block". anandtech.com. 2016-10-31. Retrieved 2011-01-13. ^ "Hi3798C V200 Brief Data Sheet" (PDF). 2015-08-07. Retrieved 2016-03-01. ^ "Advanced VP9 decoder now available for Imagination's PowerVR Series6 GPUs". Imagination Blog. Retrieved 2016-01-18. ^ "New Intel IGP drivers add H.265, VP9 hardware decode support". The Tech Report. Retrieved 2016-01-18. ^ a b "intel-hybrid-driver". github.com. Retrieved 2016-04-19. ^ "VP9 Encode Support Added To VA-API – Phoronix". www.phoronix.com. Retrieved 2016-05-27. ^ "Helio X20 / X25 | MediaTek". Retrieved 9 June 2016. ^ "MediaTek Launches Helio X30 with Cortex A73, 10nm Node and PowerVR GPU". Retrieved 2016-09-28. ^ a b c d "Codec Support Matrix". nvidia.com. Retrieved 2016-07-27. ^ "NVIDIA Tegra X1 Preview & Architecture Analysis". www.anandtech.com. Retrieved 2016-08-07. ^ "Snapdragon 820 Processor Product Brief | Qualcomm". Qualcomm. Retrieved 2016-01-18. ^ "Snapdragon 835 Processor | Qualcomm". Qualcomm. 2016-12-06. Retrieved 2017-01-29. ^ "Snapdragon 845 Processor | Qualcomm". Qualcomm. 2018-03-13. Retrieved 2018-03-13. ^ "Realtek". www.realtek.com.tw. Retrieved 2016-12-09. ^ "Experience the Amazing Exynos by Visiting Samsung Exynos Website". www.samsung.com. Archived from the original on 2015-11-12. Retrieved 2016-01-18. ^ "Supported codecs on Exynos variant of the Galaxy S7". imgur.com. Retrieved 2016-07-06. ^ "Samsung Exynos 9 Series (8895) Mobile Processor". Retrieved 2017-03-31. ^ "Exynos 9 Series 9810 Processor". Retrieved 2018-03-13. ^ a b "Ittiam's VP9 product page". Retrieved 28 May 2016. ^ "Next Gen Open Video (NGOV) Requirements" (PDF). WebM Project. Google. Retrieved 2012-12-29. ^ Paul Wilkins (2013-05-08). "VP9 Bitstream finalization update". WebM Project. Google. Retrieved 2013-05-17. ^ "VP9 profile 0 release candidate". Chromium (web browser). Google. 2013-06-11. Retrieved 2013-06-19. ^ "Native VP9 decoder is now in the Git master branch". Launchpad. 2013-10-03. Retrieved 2013-12-08. ^ "Update on WebM/VP9". Google Developers. 2014-06-25. Retrieved 2014-06-28. ^ "Remove experimental-bitstream flag for profiles>0". Chromium (web browser). Google. 2014-10-03. Retrieved 2015-03-02. ^ Thomas Catan (2011-03-04). "Web Video Rivalry Sparks U.S. Probe". The Wall Street Journal. Dow Jones & Company, Inc. Archived from the original on 2015-03-18. Retrieved 2011-12-31. ^ Cheng, Jacqui (2011-03-04). "Report: DoJ looking into possible anti-WebM moves by MPEG LA". Ars Technica. Condé Nast Digital. Retrieved 2011-12-31. ^ "Ittiam and ARM are the first to efficiently bring Google's VP9 to mobile devices". ARM Community. 2014-01-07. Retrieved 2013-07-04. ^ "Ittiam's H.265 and VP9 Solutions to Have Widespread Coverage at CES 2014". ARM Community. 2014-01-07. Retrieved 2013-07-04. ^ "VeriSilicon Introduces Hantro G2v2 Multi-format Decoder IP with VP9 Profile 2 to Support 10-bit Premium Internet Content". Business Wire. 2015-03-02. Retrieved 2015-03-02. ^ Michael Larabel (2015-04-03). "libvpx 1.4.0 Brings Faster VP9 Encode/Decode". Phoronix. Retrieved 2015-04-03. ^ Jan Ozer (May 24, 2016). "Netflix Discusses VP9-Related Development Efforts". streamingmedia.com. Retrieved June 4, 2016. ^ "A High Performance, OpenCL-Based VP9 Encoder". phoronix.com. 12 January 2016. Retrieved 12 January 2016. ^ "Ittiam accelerates open source VP9 encoder in partnership with Netflix and Google". 2017-03-31. Retrieved 2017-04-03. ^ a b Ozer, Jan (2019-03-28). "Sisvel Announces Patent Pools for VP9 and AV1". Stream Learning Center. Retrieved 4 April 2019. ^ Cluff, Phil (2019-03-28). "Did Sisvel just catch AOM with their patents down?". Mux.com. Retrieved 4 April 2019. ^ Ozer, Jan (2019-03-28). "No Content Royalties in Sisvel VP9/AV1 Patent Pools". Streaming Media. Information Today Inc. Retrieved 4 April 2019. ^ Stephen Shankland (September 12, 2014). "Google's Web-video ambitions bump into hard reality". CNET. Retrieved September 13, 2014. ^ "The Alliance for Open Media Welcomes New Members and Announces Availability of Open Source Video Codec Project". Alliance for Open Media. 2016-04-05. Retrieved 2016-04-07. ^ Jan Ozer (2016-04-12). "A Progress Report: The Alliance for Open Media and the AV1 Codec". StreamingMedia.com. Retrieved 2016-04-13. [...] code from VP10, by far the most mature of the three, will dominate. ^ Zimmerman, Steven (15 May 2017). "Google's Royalty-Free Answer to HEVC: A Look at AV1 and the Future of Video Codecs". XDA Developers. Archived from the original on 14 June 2017. Retrieved 10 June 2017. ^ Jan Ozer (2016-05-15). "What is VP9". StreamingMedia.com. Retrieved 2016-06-19. Wikimedia Commons has media related to VP9. "WebM and the New VP9 Open Video Codec", I/O (YouTube) (video), Google, 2013 . Jan Ozer (Streaming Media Magazine), June 2016: VP9 Finally Comes of Age, But Is it Right for Everyone?